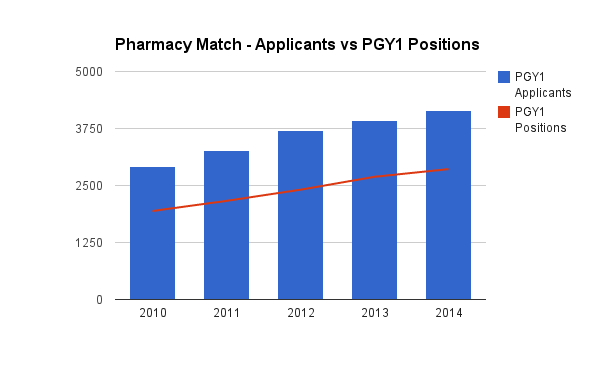 Let me jump right into this, the match for pharmacy students is a stressful time. The process of interviewing, deciding which programs you like, creating your match list, and then the wait are a time of great anxiety. One question I get asked a lot by students are what their chances of matching are. And really, I usually bring up the data from the ASHP Resident Matching Program to give them a glimpse of past years. That being the case, I decided to visualize it better this time around as we wait for the results of the 2015 match cycle. Essentially all of the data I am presenting here I pulled from the ASHP matching program. I am not doing an extensive breakdown (for that go look at the actual data) but rather a summarization of key data. I am only looking at PGY1 Programs, and not breaking down applicants based on year of graduation (but reality is most applicants are based on year of graduation, with a small minority of applicants from past graduations). The applicant pool is also only based on those that actually participated in the match, and did not sign up for it. The key distinction is that not everyone gets an interview, or that some will back out of the match process for personal reasons or other opportunities. Lastly, I am not going to do a statistical analysis. The thing that jumps out here is that overall, the number of programs and positions is growing, albeit slowly. Since 2010 to 2014, there are now 332 new programs and 918 new PGY1 positions. The issue of course, is the applicant pool. Overall, there still seems to be a linear delineation of positions to applicants, with no distinct sharp increase or decrease in any subset. However, no matter what, there will always be a sizable number of applicants that do not match as there is no surplus of available positions. This is where things really get interesting, we see that there is a steady increase in the number of applicants each year. In fact, between 2010-2014 there are now 1,227 more applicants, and it will be interesting to see what 2015 brings. Overall, unmatched rates remain very similar each year, >35% (2010-38%, 2011-38%, 2012-39%, 2013-37%, 2014-36%). The area that most students fear is being unmatched and having to compete with programs that did not match. The reality of the situation is that it is a large number of unmatched applicants, and very few programs that do not have filled spots upon the arrival of match day. Where Does Pharmacy Residency Stand? Lastly, coupled with the concern of a 'Pharmacy Bubble' and potential surplus of pharmacy students versus positions, many schools and faculty have advocated for students to pursue post-grad training to stand out in a potentially competitive marketplace of jobs. Taking this all in consideration, there will likely need to be further growth in terms of residency programs and positions in order to keep up with demand. How many positions in the US require a PGY1/PGY2 position on an annual basis? How many of said positions are actually opening up? What kind of positions are these? Are we in for a quasi-grey area in the near future with a lack of positions or attainable jobs afterwards? What is the value of PGY1 Hospital versus Community residency programs? Has demand shifted over past few years? I hope you have found this of interest or help, and would welcome comments or suggestions for adjustment to the data presented if it is felt to be of benefit.